How can we close a $18 trillion gap in infrastructure investment? Persistent underfunding of critical infrastructure worldwide is hampering economic progress, and exposing businesses and communities to significant risks. Existing physical and digital infrastructure are under stress from population growth and face challenges from cyberattacks, extreme weather and climate change. New infrastructure development is increasingly intertwined with rising geopolitical tensions, and given the potential for a global economic downturn, funding could come under further pressure. This year’s risk perception survey, which underpins the Global Risks Report 2019, highlights the need for a renewed global focus on infrastructure resilience and investment. While respondents’ near-term risk concerns centre around geopolitical conflict, trade relations and cyberattacks, the failure of critical infrastructure and infrastructure investment shortfalls are prominent among longer-term concerns. Almost three quarters of this global infrastructure investment gap is attributable to the road and electricity sectors, with the remainder in telecommunications, rail, water, airports and ports. On a regional basis, a similar proportion of the need can be attributed to Asia and the Americas. In developed markets, investment is predominantly required for infrastructure replacement and upgrading purposes. In underdeveloped regions, new infrastructure is predominantly required to enable economic development and meet basic needs such as utilities and transport networks. Around the globe, this need is clear. US infrastructure was recently rated a D+ overall, with dams, roads and energy scoring some of the lowest grades. In Italy, some 300 bridges are at risk of collapse. Ageing power plants in Europe and recent load-shedding (shutting down power in localized areas to prevent countrywide blackouts) in South Africa due to breakdowns continues to be concerning. India has the 10 fastest-growing cities globally and its continued economic success depends on meeting vast infrastructure needs. Meanwhile, state-sponsored cyberattacks in the US and Saudi Arabia have elevated concerns about the vulnerability of infrastructure to growing geopolitical tensions. 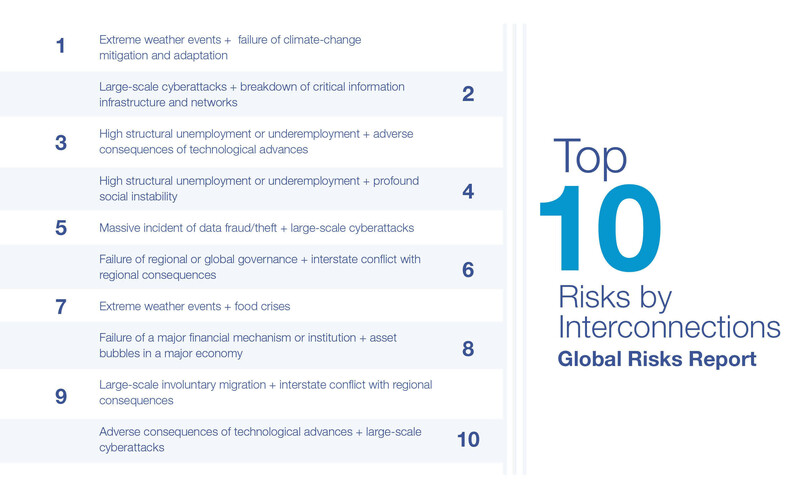 Underinvestment in infrastructure amplifies our exposure to major global risks. Ageing physical infrastructure increases the vulnerability of communities to natural catastrophes, and outdated security infrastructure adds to the risks stemming from cyberattacks. Bridging the underinvestment gap is made more complex and challenging by growing geopolitical frictions. Current tensions are leading to increasing project costs, lengthy project timelines, restrictions on investment and exports, and competition for influence. Economic protectionism for home-grown players, trade tariffs affecting commodities, buy/make local agendas, and preferred suppliers within bilateral deals are impacting the competitiveness and reliability of suppliers and increasing construction costs. For example, the cost of steel for an infrastructure project on the Lower Rogue River in Detroit increased by 13% due to recent US tariffs on steel imports. Deepening security concerns about foreign technology suppliers in critical infrastructure deployments are leading much-needed next-generation infrastructure deployments to become a long and more expensive process. For example, there has been a recent push from Western economies, such as the US, UK, Australia and New Zealand, to exclude Huawei 5G equipment from their communications infrastructure. From a geostrategic perspective, China has been aggressively seeking infrastructure investments and contracts around the world to extend Beijing’s influence, including its signature Belt and Road Initiative. The US recently countered with the establishment of the US International Development Finance Corporation, a new foreign aid agency with $60 billion in funding to bankroll infrastructure projects in Asia, Africa and the Americas. With over 90% of global risk survey respondents anticipating increased economic confrontation between the world’s major powers in 2019, infrastructure development and financing is likely to get even more complicated and challenging in the near term. Given the fiscal pressures on government, the private sector needs to be engaged more fully to close the investment gap. To improve the resilience of global infrastructure, we need new approaches to public-private partnerships, project finance and risk management. First, businesses and government should collaborate to strengthen existing infrastructure resilience. Government and industry should expand the sharing of information about critical infrastructure threats so that key physical and system vulnerabilities can be explored and addressed. There should also be greater public-private sector coordination around the design of critical infrastructure networks in urban planning, and more collaborative emergency response plans for natural catastrophes, cyberattacks and other risk events. Second, we need to improve project “bankability”. There is no shortage of private investment capital available, so the challenge is to define economic structures which are sufficiently attractive to investors. Investors value stability in the political and regulatory environment, and governments can take steps to de-risk investments for the private sector side of blended investments. For example, in Argentina the government has committed to a contingent contribution if the sums in the public-private trust don’t meet public-private partnership obligations. The public sector should also consider monetizing existing infrastructure assets which have attractive investment characteristics (through leasing or sales to the private sector) to free up public sector capital for investment in new infrastructure. More than ever, companies in the broader economy need to think hard about their dependencies on infrastructure, and examine risks to their bottom line and share price due to unexpected failures. Not only should they devote efforts to exploring “what-if” scenarios, but they should engage more fully with the public sector to explore opportunities to collaborate constructively, in order to remain resilient in this challenging risk environment.